I was hoping to have properly "finished" shore kitchen and living room photos to share by end of summer but as you can tell from the calendar, it's just not going to happen. Oh well - at least I can use the excuse that we had fun at the beach this summer while my to-do sat collecting dust. We'll be back over the colder months to get a few more to-dos completed. Thankfully the kitchen is nearly complete (see here for more of the reno and here for the before) and I did get the task of hanging that jellyfish print up in the kitchen complete. I love it! The only thing left to do here is add a few accessories (I wish I could say the same for the sad state the living room is in!). I promise the next time you see this room, I really will be calling it the "after" and sharing lots more photos and all of the sources. Any suggestions for accessories? I always find putting those finishing touches a challenge so I'd love a little inspiration. Love this space. It's so pretty. As far as accessories, I think I would put a green plant between that awesome print on the wall and the sink. It would soften the wall corner. Can't wait to see what you do!! No big plants here - we aren't there to water it all the time. We do have some succulents so they might work since they dont need too much water but they would be pretty small. That looks amazing! What a difference from several years ago. Maybe one of those big shell/bowls? Good idea! I actually have those already so that works. I'm really loving the neutral color palate, it really brings focus to the cool print and funky furniture. OMG - i had no idea those things had a name but I need one! Thanks. And they really gurgle! My girls get such a kick out if it! I love how clean & fresh it looks. I don't think you need many accessories. If you decide to add some I love the suggestions already given: a plant or a gurgle pot, both of those are great ideas! I like to accessorize with the seasons, with whimsy or with something functional. 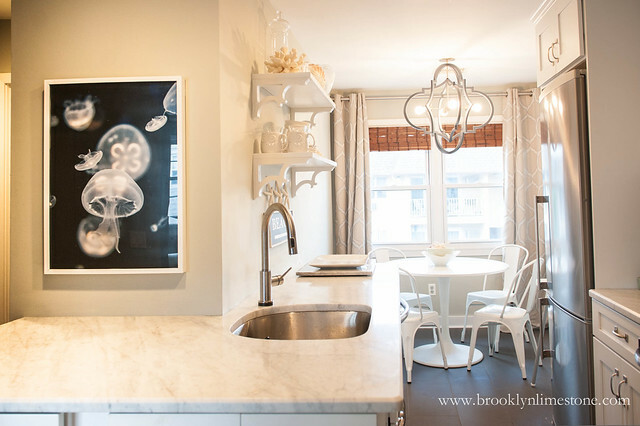 That jellyfish print is gorgeous. A wooden "organic form" salad bowl would be cool, bringing in the blinds and the wood flowers. I am thinking something from viva terra in either the carved acacia wood or rosewood, maybe? Plants are always nice, but then you need to make sure to water it. Great idea...i think a big wood bowl would be great. Are you still selling prints?! The link to your print shop seems to be broken, but I would absolutely love a print of the jellyfish photograph for my master bedroom. So beautiful.